Is there anything cooler than things that glow in the dark? Well, yes, I suppose so, but it is definitely up there. It’s great fun experimenting with things that glow in the dark. One of my favorite ways is to use black lights! These are the lights that you find in use in quite a few places: haunted houses, rock and mineral displays, some parties, some art displays, at crime scenes, and in banks. But why are they in so many places and how do they work? A black light. These can often be found in party stores, especially right around Halloween. A little tip: if you wait until after Halloween, they often go on sale! Stuff to explore like markers, highlighter pens, money, rocks, clothing, different kinds of paper, etc. Mount the black light to a wall or have a friend/parent help you. It can be hard to explore if one hand is constantly holding onto the black light. Try holding out different materials and see what happens to them under normal and black light. Try coloring with highlighters and markers. There are even some special paints specific for use under a blacklight. What do you discover? Black lights are special light bulbs that filter out most light except for ultraviolet (UV) rays. The electromagnetic spectrum is divided into many different types of radiation, a segment of which is white light, the light we can see, which is divided into Red, Orange, Yellow, Green, Blue, Indigo, and Violet (ROY G BIV). On the higher-energy range of light, just above the color violet is ultraviolet rays which we are most familar with in our use of sunscreen to prevent skin damage. While a standard black light doesn’t typically have enough power to cause sunburns, they are bright light sources. We can’t tell how bright they are because most of the light rays being produced are beyond our range of vision. We only see a small amount of violet light that isn’t 100% absorbed by the filters. But the UV light is there and in pretty good quantities, just light a strong light bulb. So don’t stare at UV light sources like black lights as you can cause eye damage, just like staring at a bright light source for too long. So why do black lights make things glow? Specifically, they make substances called phosphors glow. Phosphors absorb the UV light, then release the energy immediately as visible light. They should not be confused with materials like phosphorescent paint that absorb white light energy then slowly release the energy as a green glow. 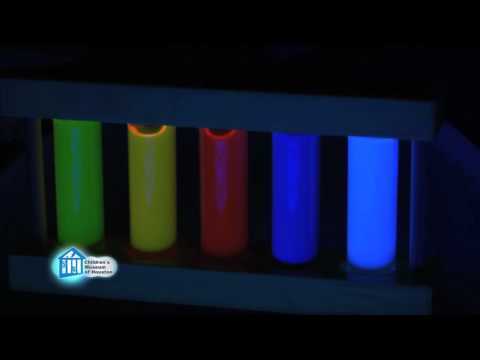 Phosphors, which do have phosphorus as a part of their chemical make-up, are present in several dyes, which makes them great to create glow-in-the-dark paints, markers, artwork, etc. Highlighter pens use phosphors to appear brighter under normal light, so they often glow quite interestingly under black lights. Many countries also use phosphors on their money to prevent counterfeiting and some places use phosphor inks on their hand stamps to ensure they know you already paid admissions. Many laundry detergents use phosphors and other substances as color brighteners, which is why white and other light clothes glow under the light. Also, our bodies use phosphorus to create many body parts, which is why our nails and teeth glow under the black light. It is also why forensic scientists use black lights when searching for evidence at crime scenes.